Choose The Mandala That Resonates With You The Most to Reveal What Kind of a Person You Are! The word “mandala” comes from Sanskrit which means circle. It is a geometric structure that is dominated by triangles and squares organized around a unifying center. All shapes are usually sacred geometry. As a spiritual and ritual symbol, a mandala represents wholeness. It is seen as a model for the organizational structure of life, a cosmic diagram that emphasizes our relation to the infinite, the universe, and the world that extends beyond and within our bodies and minds. Describing both the material and non-material realities, the mandala appears in all aspects of life, like the celestial circles: earth, sun, and moon; and the conceptual circles: friends, family, and community. From the choices below, select the best mandala that speaks to you to reveal both your material and non-material realities. 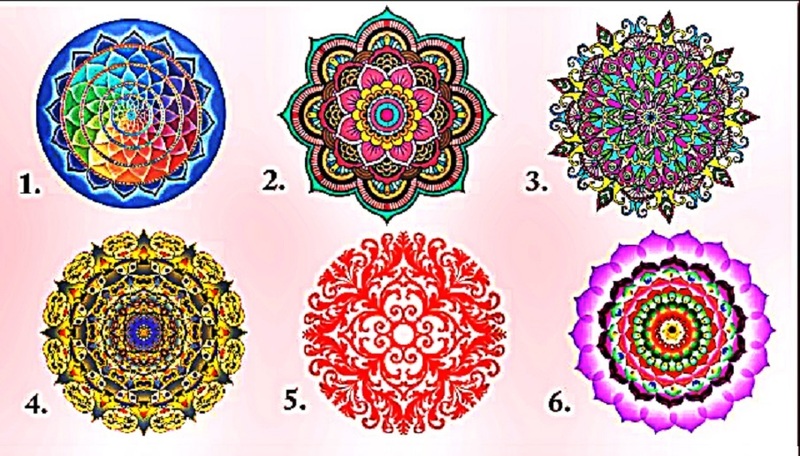 Choose The Mandala That Resonates With You The Most! The first mandala, which represents the entire color spectrum, symbolizes the “know-it-all” type of person. If you choose this one, you are the thinker. Your mind is always processing varied thoughts from big to small things. However, your insatiable curiosity may overwhelm you. Thinking so many things at a time makes your mind scattered. You need to calm down and take some time off. Yoga or exercise may ease your mind a bit and enables you to focus your energy and thinking on things that truly matter. The second mandala symbolizes travel. If this speaks to you, then you find great fulfillment in traveling. Traveling the world might be everybody’s dream. What makes you stand out from them is your belief that money should be spent on experiences instead of on things. If you have been traveling for a while now, that’s great news. You indeed followed your natural instincts. But if you haven’t tried but wished you could, never hesitate to do it. Traveling is a part of who you are. The third mandala stands for experience. If this color spectrum resonates more with you, it means you are the type who always want to do something for the mere experience of it. You could never get enough of life, that is why you want to experience everything. Despite the troubles some experiences give you, you still find it all to be worth the try. But you have to be wary of the experiences that you want to try because some of it could be harmful to you or your loved ones. Gambling and drugs may look thrilling, but you need to be extra cautious when thinking of trying these things. Always remember, what had been done cannot be undone. So you need to be full of wisdom. You don’t need to calm your spirit, as long as you know how to select the experiences that make you better each day. The fourth mandala that represents the golden color stands for money. You are the type who work for money. There is nothing wrong with this one because humanity thrives and progresses because of the circulation of money. What causes problems is the wrong use of money. In your case, you are torn between possessions and spiritual experience. Even if you have earned a lot of money, you come to a point where you ask what’s the point of it all. Once you reached this point, it might be the best time to focus on your spirituality. Minimize your workload and then ask why you have to overwork yourself and earn an amount of money that is, oftentimes, more than you need. The fifth mandala represents the color red. As a color of fire and blood, red is associated with energy, war, danger, strength, power, determination, passion, desire, and love. It is an emotionally intense color that increases respiration rate and raises blood pressure. Because it is highly visible, it is used in stop signs, stoplights and even in fire equipment. Red also stands for courage, the reason why many national flags have some color red in them. These things give you clues that you are someone who climbs on top, craving for power and danger. Though, you may choose to be there to be the voice of many. Being on top signifies that you have all means to help those below you. Learn to stoop down and lift humanity up. Not everyone has the courage that you got. When you learn to be altruistic, your journey to the top creates more meaning and purpose in your life. 6. The Calm And Noble Spirit. This sixth mandala stands for calmness and nature. You are the type who embraces yourself with nature. Purple is a combination of the calm stability of blue and the fierce energy of red. It is mostly associated with royalty, nobility, luxury, power, and ambition. On the other hand, purple is also identified with extravagance, creativity, wisdom, dignity, grandeur, devotion, peace, mystery, independence, and magic. Most of all, purple is associated with the third eye or pineal gland. You are the restless seeker who is out to find something bigger than you, than life, than humanity. You are in the right place when you seek in nature. The feminine energy you radiate uplifts others up. The world finds you the romantic and the deep thinker.